Only a week before the disappearance and alleged killing of Saudi journalist and commentator Jamal Khashoggi, it was confirmed that missing Interpol chief Meng Hongwei was being detained in Beijing  on corruption charges. The news came amid ongoing investigations  over the botched poisoning of former Russian spy Sergei Skripal and his daughter in the UK earlier this year. These incidents raise questions about the reach of autocratic states in 2018 and clear concerns about international law and security, diplomacy and human rights. How should the international community respond to alleged state-sponsored abductions, murders and detentions, and what should the consequences be for states that refuse to comply with international human rights norms and legislation? The British government’s response to the Skripal attack has been one of no tolerance to Russian aggression. The killing of a British citizen on home soil unequivocally justified Britain’s crackdown on the Kremlin’s alleged hitmen, but that’s not to say that a similar ‘mobster strategy ’ employed by Saudi Arabia should be wilfully ignored. Despite finally admitting  that Khashoggi was murdered inside the consulate, the Saudis appear at the very least to have carried out a state-sponsored abduction, and if it’s to be the last time it happens they need to be taken to task over it. It appears the true face of Crown Prince Mohammed bin Salman (MbS) has been unveiled. Despite some landmark reforms such as reducing the weight of the mutaween (religious police) and permitting women to drive, Khashoggi’s murder is yet another example of reckless and capricious decision-making  that has gone badly wrong. Over the past 12 months, MbS has been locking up critics and dissenters of all stripes, from women activists and Twitterati critics to the bizarre round-up of royals and journalists  in the Ritz-Carlton for three days and the detention of Lebanese Prime Minister Saad Hariri. In September  a regime critic was allegedly followed and beaten up on the streets of central London. Three Saudi princes living in Europe have gone missing, with evidence  of their abduction tracing back to the Saudi state. Khashoggi’s murder was conducted in the most savage of manners, though this isn’t out of the ordinary for the Saudi state, and should its actions go unchallenged, it certainly won’t be the last killing of its kind. The international community must decide whether it wants to be complicit in normalising the flouting of civil rights and other liberal democratic norms, or in paving the way for autocracies to rise. Donald Trump’s response is telling. Although the US president’s initial statement  expressed concern and implied a firm hand would be applied, his comments over recent weeks have gone from one extreme to another. The president quickly backpedalled on his initial response and adopted the Saudi narrative of ‘rogue killers’ as a plausible explanation for the journalist’s death. 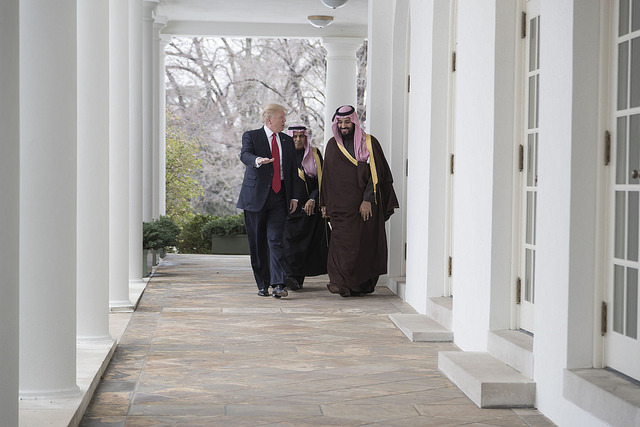 Then he reverted to criticising the Saudi effort to silence Khashoggi, saying , ‘The cover up was one of the worst in the history of cover ups.’ Trump’s motives are clear: he is reluctant to give Russia and China the opportunity to pick up the cheque for Saudi Arabia’s enormous arms budget and is attempting to protect the relationship with the kingdom in a bid to keep billions of dollars in US defence contracts. It’s no secret that the US and UK derive enormous economic benefit from being allied to Saudi Arabia, most notably through the sale of military equipment. The countries have also spent years carefully nurturing diplomatic relations, especially after the 9/11 attacks. Severing economic and diplomatic ties with the kingdom would not be without consequences . However, in order to send a loud and clear message that such a flagrant disregard of international principles of law and order and human rights will not be tolerated, serious consideration must be given to cutting those ties. Assertive and principled leadership is required. It is not enough to make statements calling for answers; the joint statement from the UK, France and Germany  was unsubstantial at best, and Trump’s flip-flopping doesn’t inspire a great deal of confidence. Turkish President Recep Tayyip Erdogan’s statement last week  stopped short of accusing the Saudi government of killing Khashoggi, but it’s worth recognising that his comments are likely shrouded in the geopolitics of Gulf power play s.
The boycott of Riyadh’s glittering international investment summit known as Davos in the Desert  by various ministers and big businesses  is a step in the right direction, but a lot more effort needs to be made to demonstrate that the international community is willing to stand up to states and leaders that impose selective interpretations of justice. And although United Nations human rights chief Michelle Bachelet made a statement calling for diplomatic immunity to be lifted , the UN must take the initiative and demonstrate that appropriate measures will be taken. An independent investigation into the death of Khashoggi that is endorsed by major players and holds those responsible accountable for their actions will be the only outcome that will suffice. Sofia Patel is a non-resident fellow at ASPI and a PhD candidate at King’s College London. She tweets at @laramimi. Image courtesy of the White House on Flickr.